Bloom Time Early to late summer. Foliage Type: Dark Green that is deeply cut and shaped like lances. Appears as foliage is prickly but underside are downy. 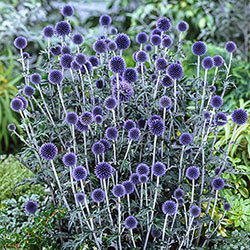 Flower Form: Large 1 1/2 - 2" globes born on grey stems. Soil Requirements: Well drained. 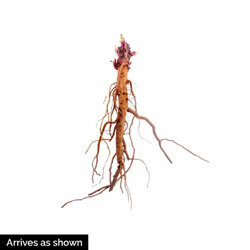 Once established it is tolerant of a wide range of soils, except wet ones. Pruning: Deadhead initial blooms. Once done blooming, cut all flower stalks to the basal foliage and leave to overwinter. Can be divided in early spring by carefully splitting a few offsets of the base of the established clump.